Puzzle 1 can be found here. Drag your adult villager to the whale bones. He/she will take a whale bone to the construction table. By common sense, drag an adult villager to the construction table. He/she will make a pickaxe out of the whale bones. The pickaxe will be near the anvil.Drag an adult villager to the pickaxe and he/she will chop the wood that is behind the crafting hut.Drag an adult villager who is a scientist (it will be written if he/she is a trainee, adept or master scientist) to the science board beside the research table. He/she will draw up plans.Drag adult villagers to the crafting hut to complete repairs.The crafting hut can now be used! Use it to generate new resources to solve the next puzzles. View the crafting and resources guide here. Note: You could complete repairs for the crafting hut before chopping the wood, but you would not be able to craft until the puzzle is complete. Hidden Secrets free is a game similar to Godtower where you have to key in the answers to the puzzles to solve it and move on to the next level. There are 6 levels in this free version and much more in the paid version, but I don't think I'll be buying the paid version because I'm a miser. Anyway do support the creator because it really is a great game!! Download it on Google Play here. Level 4 Answer: Or not The clue is there. Check out your phone's touchpad (or google phone number pad) and find the alphabets that corresponds to the numbers. i.e. 1 = A, 11 = B, 111 = C, 2 = D, etc. For 2017, you have 17 days to make holiday lights. To make the lights, you need to get glass and firefly. LDW has very kindly given the formula for glass = fire + sand. Update (29 Dec): You get 50 lavastones for 20 holiday lights. I need to be faster!! 1. What is the lemur for? The lemur helps in going into the cracks to get items for you. You could get worms, magic, metal, and other random objects/technologies/food/lavastones in the cracks. You could pay for the lemur's home for $13.98 to make his stay permanent. This could be very helpful if you are sick of gathering vines and crafting rope. Sometimes there are 50% discounts so you may also wish to wait for that. 2. Why is my island shaking? This means that a crack is going to appear. Get your rope (craft vine + vine) ready for some goodness! 3. What is the yellow cloak for? The yellow cloak (hanging by the tree above the love shack) can be worn by an adult villager who is master of all skills. The master villager is important in the later part of the game (solving puzzle 10 and 11) because he/she will be needed to craft plans to make the green and blue statues. 4. What is the heron doing? Would you like HELP? Click yes to start the tutorial, no if you know what's going on. The tutorial guide you on how to complete the first puzzle, which you can also do on your own if you like. 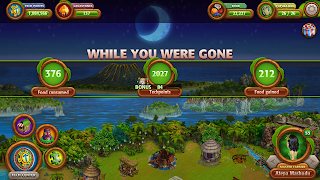 This is the newest addition to the Last Day of Work Virtual Villagers collection. 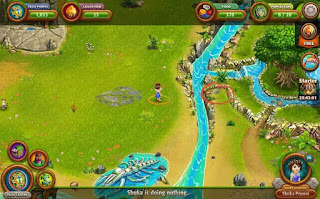 Just like all Virtual Villagers games, you play as "God" to solve puzzles and simulate life as a tribal community. I really love the vibes of the game and of course solving the puzzles!